Thread repair by inserts is a well-proven procedure. The thread which is no longer resilient is drilled, a new thread is cut. Subsequently, a sleeve reduces the thread's diameter to the required degree. This method can also be used to incorporate more resilient threads into soft materials, for example, GRP or other plastics. There are basically two types of repair tools. On the one hand, the solid insert bushes, on the other hand the inserts made of coiled wire. We supply both types for all metric and imperial threads. 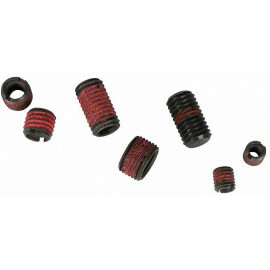 A special application is the repair of spark plug bores, for which we offer special sets. Internal tread: No.10 UNF, external thread: 3/8 UNC, length: 10 mm, drill size: 8 mm, made of stainless steel. 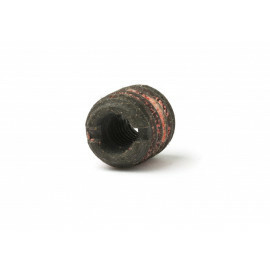 Internal tread: No.10 UNF, external thread: 3/8 UNC, length: 10 mm, drill size: 8 mm, made of carbon steel. Internal tread: No.10 UNF, external thread: 5/16 UNC, length: 8 mm, drill size: 6,6 mm, made of carbon steel. Extra thin! Internal tread: 1/4 UNF, external thread:7/16 UNC, length: 11 mm, drill size: 9,4mm , made of stainless steel. Internal tread: 1/4 UNF, external thread: 7/16 UNC, length: 11 mm, drill size: 9,4 mm, made of carbon steel.